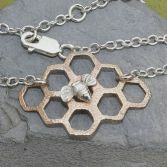 The Sweet Honey & Bee Necklace is made using one of our Honeycomb slice's (in Bronze) and sterling silver chain, clasp and little Bee. 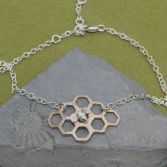 The honeycomb slice is a lovely golden colour with a tiny dimpled texture which catches the light beautifully. 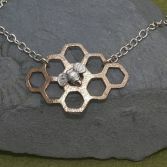 Upon the surface rest one of our little sterling silver Bees which has been soldered on top. 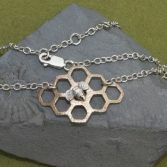 Your Sweet Honey & Bee Necklace has a strong sterling silver trace chain with links that measure 3mm by 2.5mm and a contemporary looking 11mm sterling silver lobster trigger clasp, all the rings attaching the chain and clasp have been soldered together to make the piece extra secure for daily use. 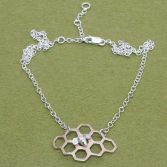 The Sweet Honey Necklace length is 18 inches and has added loops so it can be made smaller if required. 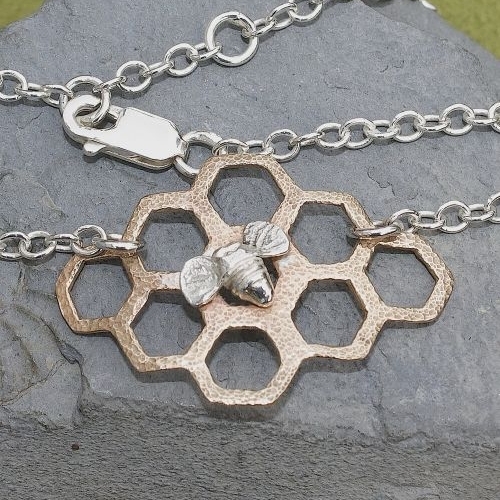 Your Sweet Honey & Bee Necklace will be presented to you in one of our signature gift boxes and will be posted to you via Royal Mail special delivery (signed for) to any UK address free of charge.